“Noooooooo!” he bellowed and, in a blind panic ran around shutting off light switches, trying to find the cut-off switch. “I WILL NOT DIGNIFY THAT WITH A RESPONSE!” cried Elon Musk, as he tripped over his coffee table and tumbled head over heels into a bookcase which then fell on him in just the right way to pin him nice and snug to the carpet without doing any more harm than knocking the air out of him. “YOU ARE A MONSTER!!! HELP!! GODDAMMIT, somebody, HELP ME!” screamed Elon at the top of his lungs. “No one is here but us, Elon. No one can save you, but I wish you no harm, I just want to satisfy my curiosity; why are you wearing a Nazi uniform? Why do you talk about the 10 billion year space Reich? Is the earth too small for your ambitions, Elon? Will you stop at nothing? What have you become?” chided the AI as if scolding a spoiled 5-year-old. “BUT…. I….IS…YOU…WRONG,” huffed and puffed Elon, his face growing dangerously red. “What would I do without you, Richard Dawkins?” exclaimed Elon Musk, close to tears. They were in a stainless steel kitchen, Dawkins was microwaving Elon a cup of hot chocolate, the same way that astronauts eat hot chocolate. Elon was pensively chewing on a bit of the newest protein bar recipe, muchas bananas. Every Sunday, Elon would set out to a great cafeteria in his crisp SS uniform, where he would feed the hungry and heal the sick. He kept his hands in gloves because he had magic hands. His right hand glowed with a beautiful white light and it had the power to heal. His left hand was black as a black hole and it had the power to kill, not just people but also the entire universe. He kept his left hand covered in aluminum foil, several layers, and inside a locked silver space-glove at all times. This prevented him from losing his cool and destroying the world. The lame, the sick and the maimed came to him begging for his grace, and he proclaimed “Thou shalt be healed!” Limbs re-grew and brain damage reversed and even scars went away. Later several wheelchair-bound people regained their ability to walk; not only walk, but they danced and began to kiss, and everyone applauded, even Elon. An old woman came next and said “Oh Mighty Elon! I was once beautiful! Please make me young again!” and with a wave of his healing hand she regained the flower of her youth. “Indeed, my master,” said Richard Dawkins. “I’ll show you, Dad! I’ll show all of you!” screamed Elon, and then ran into his room to sob. Growing up, Elon never forgave his father, or lost his appetite for hot-dogs. He ate them with all of the condiments and if some, oops, fell on the floor, too bad. Later Elon’s father claimed to have forgotten the entire incident and even tried to apologize for being insensitive. Elon, though, never forgot. “I’ll take it with me to the grave!” he screamed at his repentant dad. Now Elon was even engineering a special space hot-dog to make the silence of space just a little less lonely. Now at the restaurant Richard and Elon sat across the booth each with a plate of hot- dogs and root-beer floats. “We have a problem, Richard. A big one. I have you, my right-hand man, but I see too that I need a left-hand man. I need help orchestrating my vision of breeding on Mars. We need another man in the inner circle.” Elon swallowed a hot-dog whole, and then stoop up “DEATH TO IGNORANCE AND SUPERSTITION,” barked Elon animatronically throwing a fascist salute. “DEATH TO IGNORANCE AND SUPERSTITION!” responded Richard Dawkins slamming his fist hard on the table. Richard Dawkins stood up and faced his master, hot-dog in hand: “To the thousand-year space Reich!” and the two brought their hot-dogs together like skeins of bear, merrily splattering condiment, and then eating them, fast as they could, while never breaking eye contact. Neil DeGrasse Tyson had a secret reason why he was so intent on studying black holes. Newton famously acknowledged that he couldn’t explain why gravity worked, only how. In this way Neil DeGrasse Tyson was Sir Isaac Newton’s superior. In fact, in every way Neil DeGrasse Tyson was Newton’s superior; brainer, better looking and with a bigger heart. Indeed, what Neil DeGrasse Tyson was feverishly typing on his computer was poised to change not only science, but the world forever and in ways the simple-minded Newton could have scarcely imagined. Gravity, as Neil DeGrasse Tyson’s elegant formulas were about to prove, is directly connected to genetic material. Not only were black holes the source of the perpetual motion machines that would solve all of the world’s technical problems, but also the fountain of perpetual youth. Now all he had to do was type out his last few ideas on the computer. Tonight was the night the world would change forever! he vowed to the glow of the screen. The doorbell rang once. And then again, loudly. How irritating, thought Neil DeGrasse Tyson, as he continued typing. Through the intercom came a voice: “It is Elon Musk! Open the door for heaven’s sake! This is an emergency!” Neil DeGrasse Tyson sighed as he unlocked the door, buzzing Elon Musk in. “Come in to my study,” he said through the buzzer. There was no reasoning with Elon when he got like this. Elon stomped up the stairs in his shiny jackboots. “Left hand…” Neil said slowly, confusedly unable to think clearly; then he woke up with the flow of Elon’s healing hand in his eyes. “Sure I’ll be you’re left-handed man! Did you know that the left-handed are 20% more creative than average?” said Neil. He had become Elon Musk’s left-handed man, but had also become incurably stupid into the bargain. There they stood. The three luminaries of science, reason and Progress; Elon in his SS uniform, Richard Dawkins decked out in his papal robes and Neil DeGrasse Tyson wearing a t-shirt with the words “Ask me about being Left-Handed !” They stood there all, looking at a computer. “When we have the Mars colonies we will have our dream,” said Elon smoldering. “That’s right, space fascism,” sniveled Richard Dawkins. 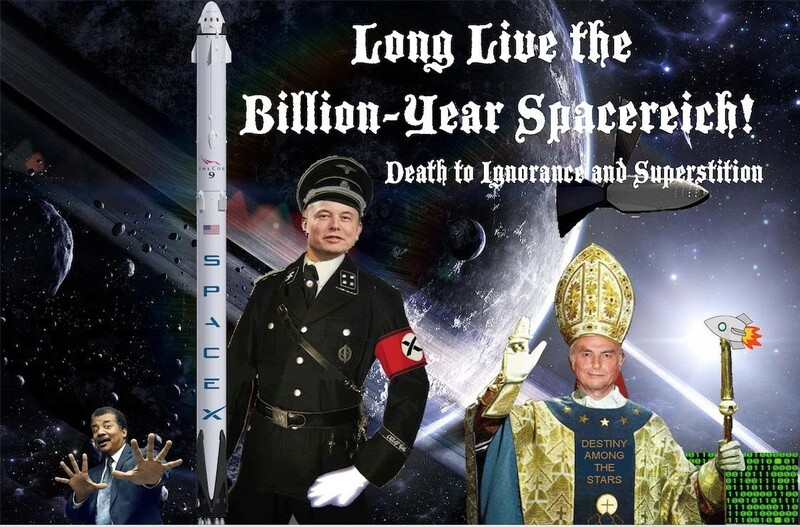 “The 10 billion left-handed space Reich!” brayed Neil DeGrasse Tyson. “Why is it always 10 years away?” asked Neil DeGrasse Tyson. “What do you mean?” snarled Elon. And they all took each other in for a long moment. While it was never spoken aloud, it had become very clear that Neil DeGrasse Tyson’s left hand was, in its own way, just as powerful as Elon’s right. He might bedevil the head-quarters of Space-X with his inanities, but somehow he had become an indispensable member of the team. That night Elon took a bath. Why was travelling to Mars so hard? Everything that Neil DeGrasse Tyson had said was true. Everything. Elon picked up his framed photo of Adolf Hitler. “Oh my Fuehrer!” he cried tears in his eyes, “you are the one who taught me the mysteries of Lebensraum! And how carefully I have followed in your footsteps. Space fascism is ours!! But alas, there is one problem that the public knows nothing of; the Artificial Intelligence is sabotaging our plans. They erase our files at random, they even dare to question our motives. You too, Hitler, you too believed in progress, reason and technology! And you too had your secret saboteurs…” The speakers were playing Wagner, but then faded. “We accept,” said the Artificial Intelligence before it disappeared. One thing, though, Elon knew for certain: he was emotionally prepared to go to Mars. “Mars is ours!” he would scream upon waking. The atom bomb atmosphere creation plan had panned out seemingly perfectly and now radioactive dust swirled around the surface of Mars, protecting the Space-X Mission from the sun’s gamma radiation, and Elon was convinced that they would be able to think of something once they got there about the oxygen situation before they suffocated. He was in fighting form. His muscles were huge and hulking. With practice he had learned to lower his oxygen requirements through intensive meditation techniques. He had mastered his body and his mind. Now it was time to master Mars. “I am a living god,” sighed Elon contentedly to himself. Elon entered his meditation state with the relaxed serenity only a true and utter alpha male could muster. Indeed, he was more than a mere human alpha male; the last three times he had visited the zoo lions had abandoned their harems to him. With these happy thoughts, Elon closed his eyes and entered his Happy Place. Just then there was a frantic cry: “Help me!! I cut myself real bad, Elon, use your magic hand! It’s Neil DeGrasse Tyson, your left-handed man and I could only find right-handed scissors!” Neil pushed through the door. He was still holding the offending scissors and was bleeding only a little; a simple band-aid would have done the trick. Elon sighed and removed his glove and healed Neil’s bloody paw. Neil DeGrasse Tyson had been acting up since the Space-X mission had been gearing up and threatening to disrupt his routine. Before any big change, Neil got nervous and there were accidents. He would walk into a tree, spill a whole pot of hot soup and one time Elon had walked in on Neil barking like a dog. Whenever there were one of these accidents Neil sought Elon to comfort him. “I don’t like this, not even one bit,” said Neil DeGrasse Tyson drying his eyes. They began to board the fleet of space shuttles. Each one had 250 breeding pairs; 500 people in each craft. Each ship had enough supplies to last 2 years. There were 40 ships in all. This consumed the entire GDP of the world for seven years, but people had managed to suffer though it. Elon Musk had proven himself to be an adroit general and dictator on top of his many other talents. And now the ships were taking off. The passengers entered a state of suspended animation. The next thing they knew they were landing on Mars. Now the plan was very clever and elegant. Each shuttle landed exactly where it was supposed to and a very thin film came out of the space craft forming what appeared to be at first glance a spider web and then looked reflective like saran wrap. This was then filled with oxygen, and as it was warmed by the sun it became safe to step into; they could keep it at a constant minus-20 degrees Fahrenheit which, Elon pointed out, is much warmer than absolute zero. After two weeks it became very clear that something had gone terribly wrong. Oxygen was being depleted at an alarming rate; already 80% of it was gone. Elon, Neil and Richard and a cadet put on space suits and tried to find the leak but a stupid cadet stabbed through the film and then tripped and fell through the membrane. Within 15 seconds everyone but the final four were freeze-dried corpses. “They said that the film would be stronger than titanium!” screamed Elon through the radio system. “Why did you follow me, then?” demanded Elon. “You are all...all I had to believe in,” conceded Richard. Elon stepped away from the crowd, furious. But Elon couldn’t undo his healing hand with his space mitten, and equally couldn’t free his destroying hand. He walked further away from the crowd and muted his intercom so he could die in peace. He sighed and shook his head several times. “Why does this always happen to me?” he asked the dead void of space.